Today there were some interesting flying objects ambling around in the sky. There was some form of exercise going on which meant that a B2 stealth bomber flew past! The racket it made was hardly stealthy however and we could still hear it after it had flown a few miles away. I then found some smaller flying objects to take pictures of. The tree next door is growing even taller. The new shoots on the ends of the branches are so pale, they look white. It looks almost like it is a Christmas tree with candles on it. Being late Spring, there are very many flowers out now. This nice purple one is somehow managing to grow out of almost bare rock, yet still have a lush set of blooms. The bees seem to appreciate it too. The sun has been out and the kids have had fun playing in the paddling pool. Muppet took one look and decided he would try and absorb all the water; Cherry did what she could to help, but does not have fur that can compete with SpongeBob Muppet! The kids did not fancy paddling any more now there is a film of smeg and fur on the top of the pool water. Muppet has been practicing digging holes in the lawn. He is progressing at getting a reasonable depth now (deep enough for the mower to fall in and cause serious swearing), but has not sorted out the 'backfill' operation needed to form a successful burial. At least he will still have access to his toys to play with for a while. The kids have a box of multi-colour sweets. If they eat them all, it would only be fair if they puke. They would just end up super hyper in practice; a grim combination of sugar an E-number colourings. As Spring moves over to early Summer, there are stacks of green shoots appearing everywhere. I am not the greatest fan of Ivy as the pollen is a right bugger come the Autumn, but it does make for interesting photos. Despite trashing his Nads on the fence the other day, and lots of tie-wraps used for repairs of the wire, Muppet has managed to make another hole to squeeze through. I do not know how he managed to get through without catching himself again; it is not really fair to make him wear the cone all the time as it does stop him getting through! The black current bush is covered with berries; so far it looks like 2015 may be great for fruit if I can get to it before the birds. The green new berries are just showing the first blush of pink.. Not long now. The apple trees are hanging with lots of newly formed trainee fruit. 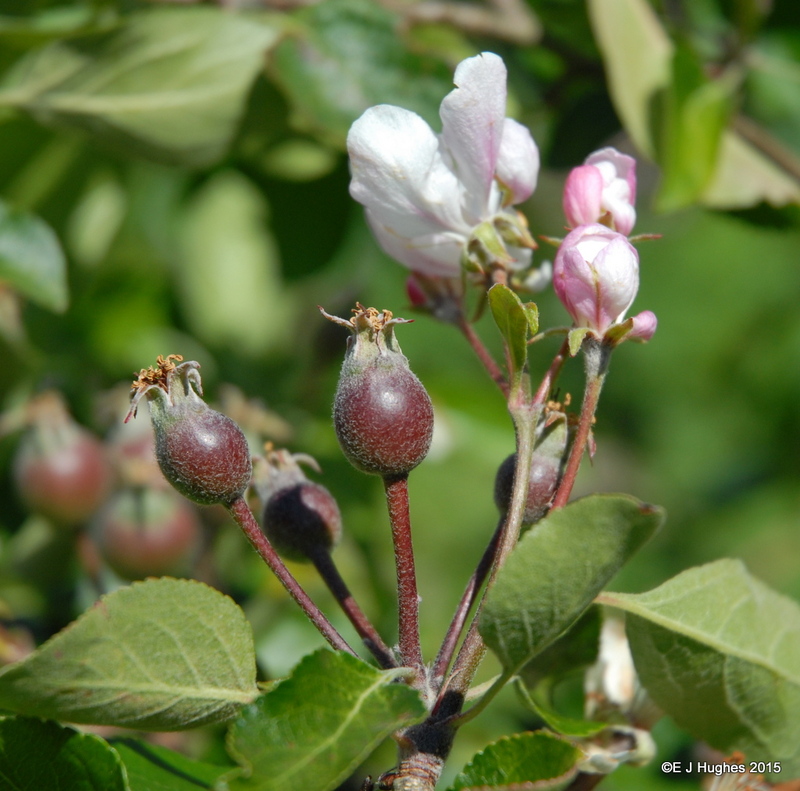 The 'June drop' is approaching, but hopefully there will be a decent crop of apples; I have eaten all the stores from last year that I had in the freezer! Muppet has been coping well with his cone; he does relish those moments however when it is taken off (or he gets it off) and he can have a really good scratch behind the ears. The cone is much easier to fit than the other option the vet suggested to stop him licking his Nads; that would involve strapping a sock across the key area! 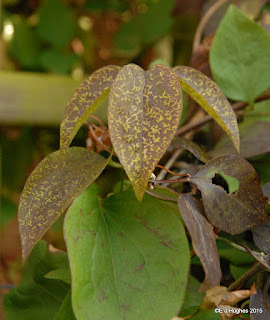 The other clematis we have on the patio has a very bizarre pattern on its leaves. The plant seems to be growing and flowering ok, so it does not seem to be too ill. It will be interesting if the flower petals have interesting patterns too. Today I spotted an interesting insect on the door frame of the yellow room; a house centipede was lurking looking for a meal. It is probably mostly the spiders that are at risk from this multi-legged beastie, but the kids were fairly alarmed by it! I have been spending lots of time typing, writing software and developing equations recently. 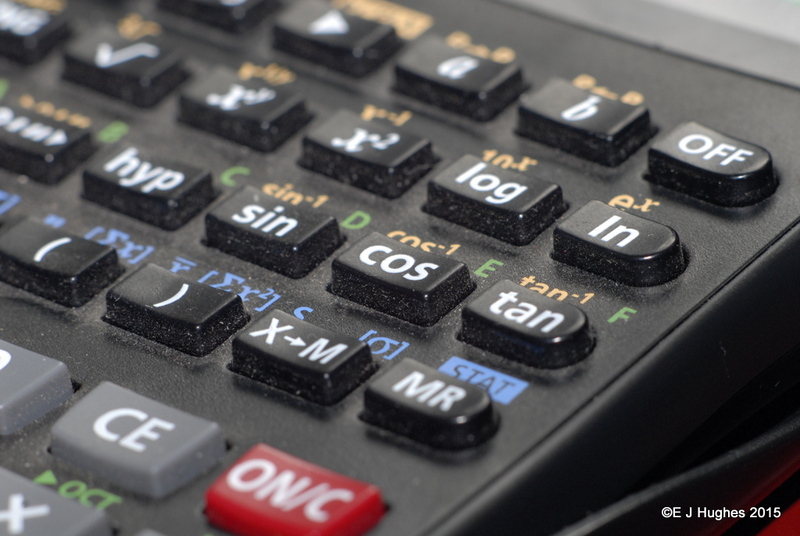 My calculator has been taking a fair bashing recently, especially the trig functions. The lettering is beginning to wear off some of the keys, which is rather sad! The clematis that covers the pergola on the patio is going mad. There are lots of new delicate leaves. 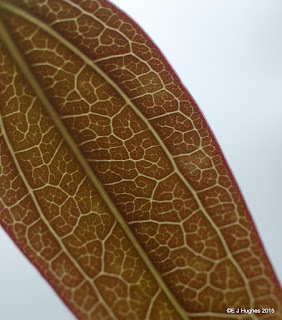 The sun was shining through the leaves, showing all the fine veins within. You can also see many of the individual cells. 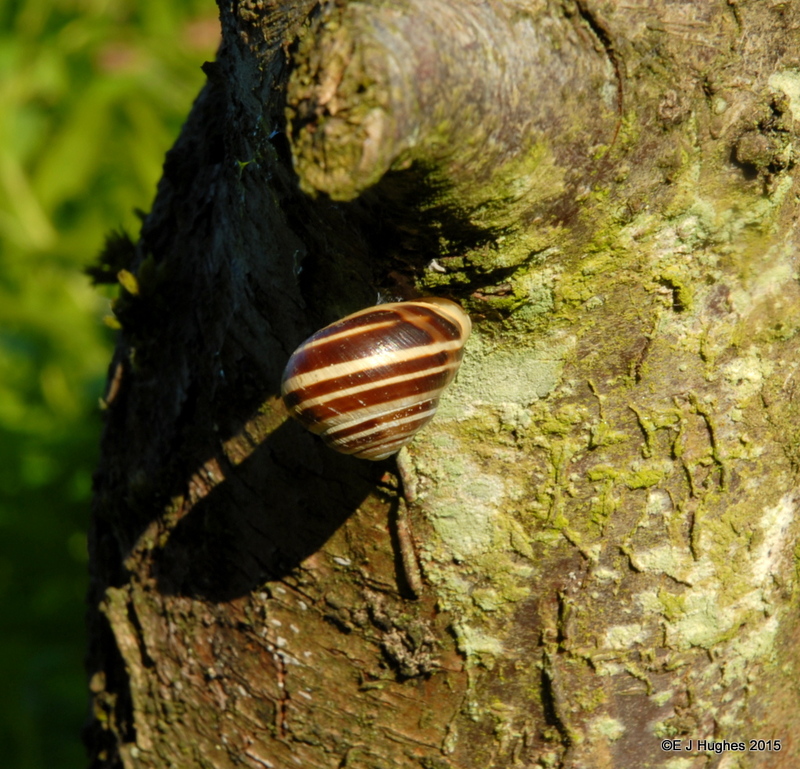 The snails in the garden are mostly of the normal 'escargot' type. This snail has its stripes in a different pattern and seems to like the old plum tree stump. It would be nice if it showed itself for a picture, but as it is right next to the bird table, it may be a tad dangerous for it. The Orchid in the kitchen is in flower at the moment. The bright purple blooms are spectacular with the evening sun shining through them. There have been other bright purple orchids in the house too. 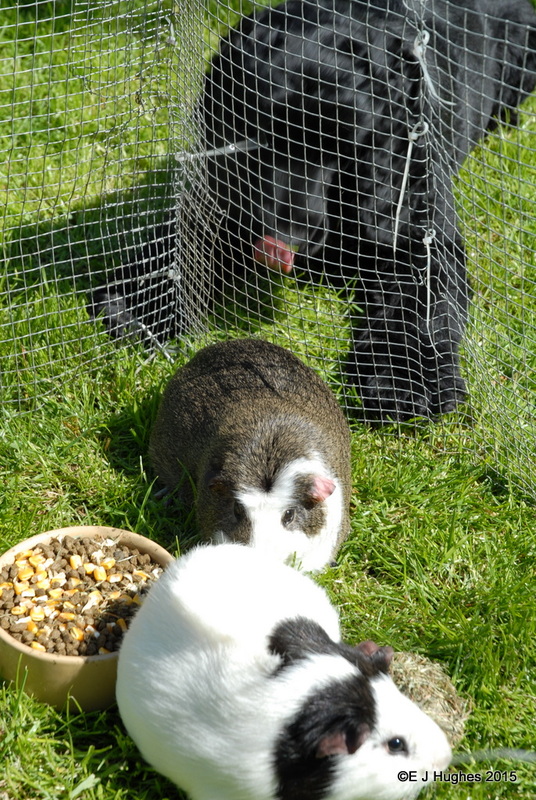 When Muppet went hunting melon in the chicken pen, it seems he caught his nuts on the fence as he jumped over. They are now swollen and he looks like Buster Gonad from Viz! He is getting used to it slowly. Liz cleaned out the guinea pigs today. 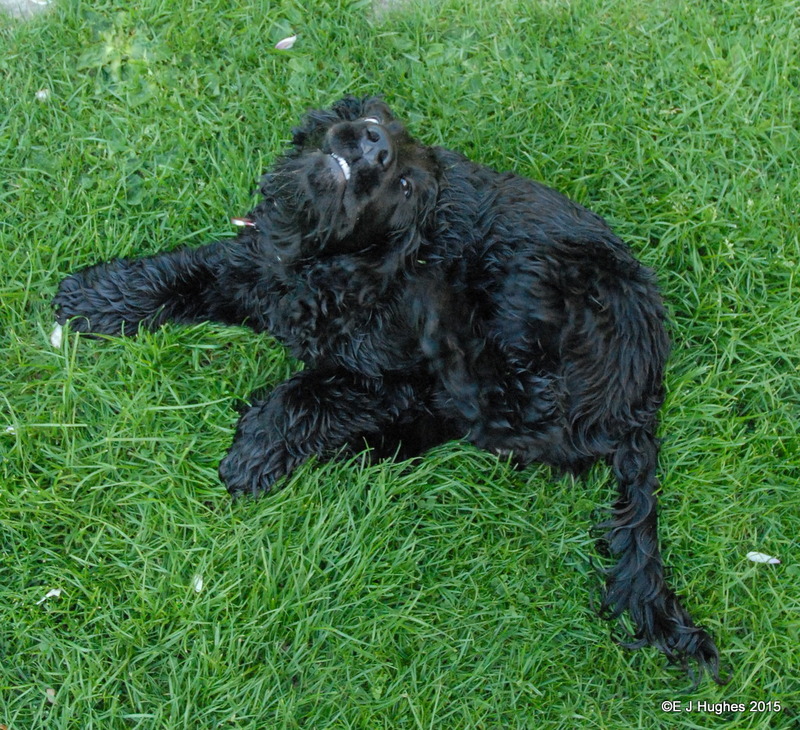 The netting was pegged out on the lawn and Wriggles and Titan had fun chasing around on the grass. Muppet was very interested and insisted on trying out his new found fence-flattening skills in order to say 'hello'. The cherry tree flowered well and had stacks of blossom; all looked promising. The pigeons have had other ideas however. 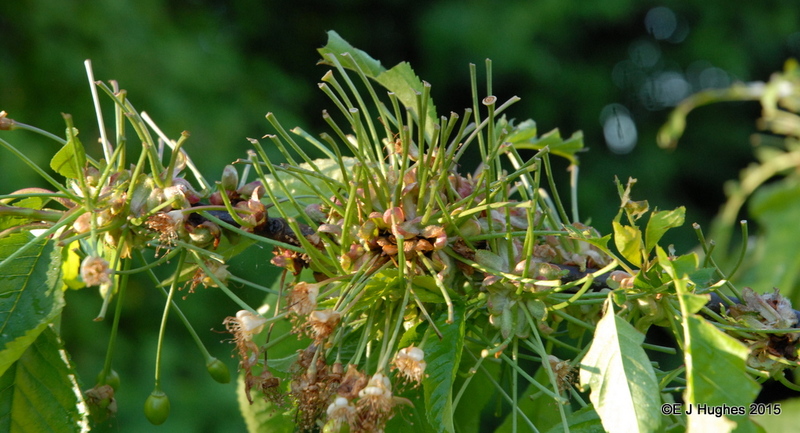 They have been sitting on the branches and stripping both the leaves and the developing cherries. The low-hanging cherries have eluded them though, but the chickens have sorted them out! There are a few green globes tucked away, but a crop of fruit is not looking promising. Muppet has developed a taste for certain fruits. He has a particular passion for melon. I made the mistake of throwing the melon rinds in the chicken pen. 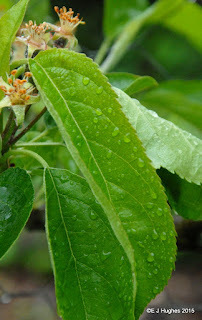 As Spring advances, more shades of green are appearing each day. This Yew tree has been perfecting its new shoots which are an interesting pale but almost florescent green colour. Today there was a motorbike parade through the town. I managed to go down too late and missed it! 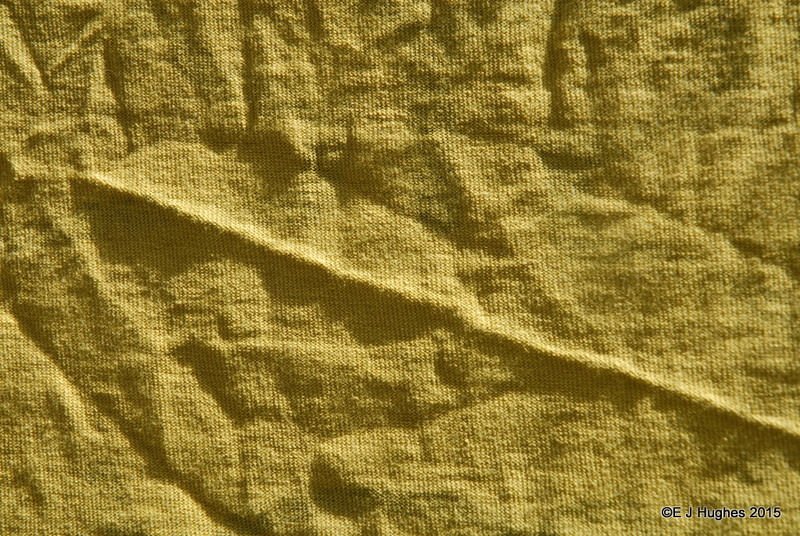 The sun was bright today and the washing was drying well. 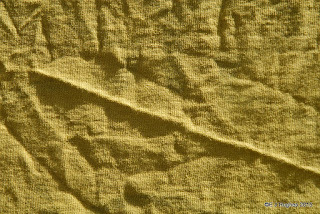 I could not resist the way the shadows fell across the creases in the T-shirt hanging on the line. The local carnival went well too, although there were some grim sights parading down the High street. 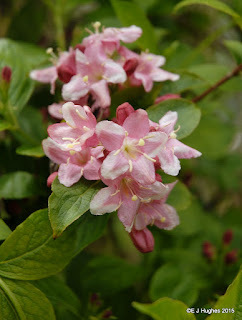 The Wygella is bursting into bloom; filling the corner of the garden with a rash of pink. I did not get around to pruning the bush last year, so it is rather large at the moment. Give it a few weeks, then it can have a decent severe hack. It has been heaving down with rain today. I noticed there have been a few visitors to the garden too; so I set up a radar and an infra red camera to see who it may be. A couple of chunky rats spent a few hours trotting around. Grrr. There was lots of White today. The bumble bees have been making the most of the Garlic flowers (it must make the honey flavoursome!) and this evening the clouds were high and pretty. 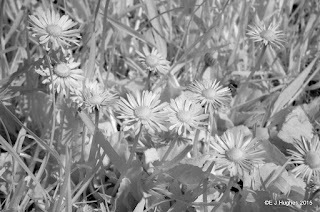 I also captured some of the daisies in the garden, although they are white, they look almost silvery when seen in infra-red. The field on the way back from school is turning yellow with the blooming of the buttercups. 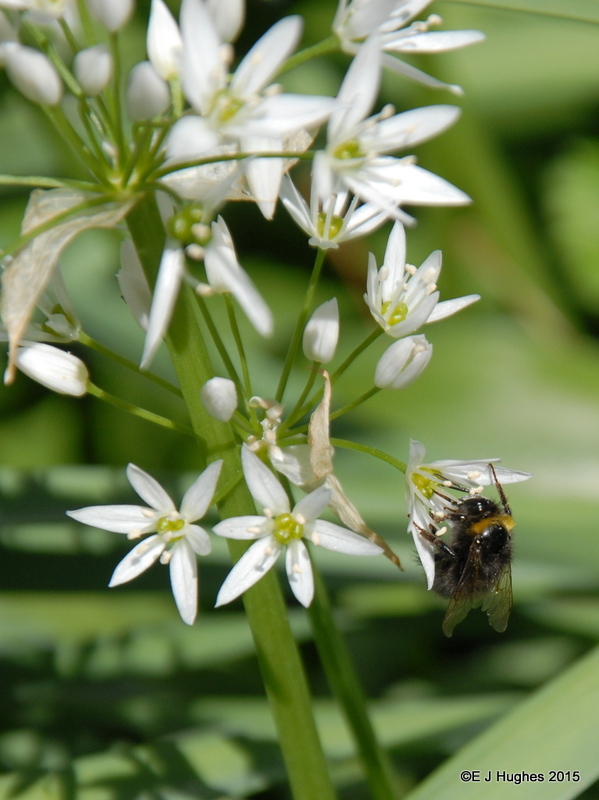 The bees seem to be enjoying the bounty. With a little rain, the shelled residents find it easier to move around. This little one was moving around down by the pond this morning. As I moved in close to take a picture, Muppet decided to come and play with the camera strap; I managed only a few pictures before he got too close and the snail hid again in its shell. Although it is only Spring, there are lots of seeds taking shape in the garden. The Dandelions have been making the most of the warm weather we had in March and April and there are lots of clocks waiting for the next windy day to spread themselves. I must pick a few before we end up with a veg plot full of Dandelions. 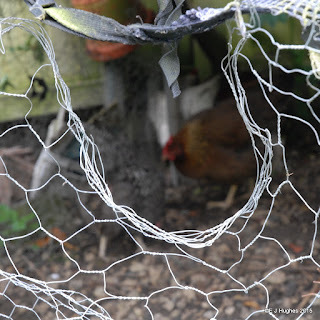 There are lots of objects in the garden that have been taken out by Muppet. A large proportion are assorted shoes that have been degraded by Lizzy's feet. Muppet must have no sense of smell or taste! The lilac at the bottom of the garden is now in bloom. 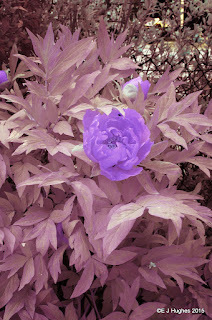 The subtle purple is augmented by the wonderful smell. 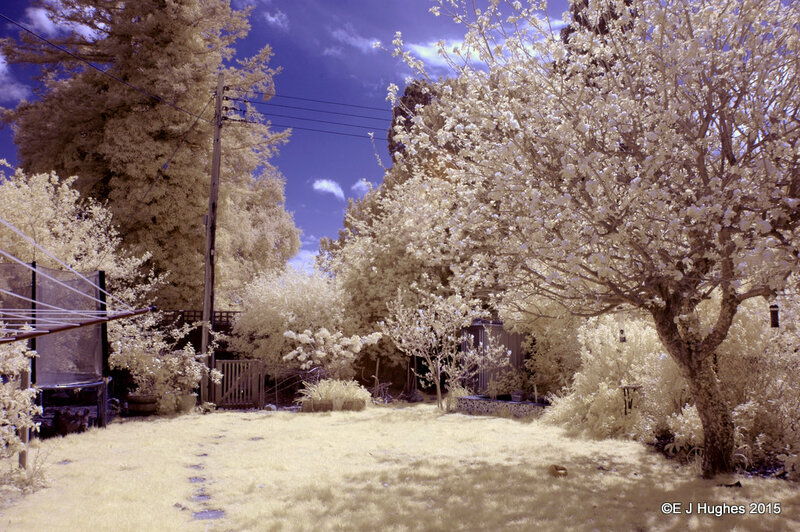 When viewed deeper into the Infra Red above an 850nm wavelength, green leaves take on a strange snowy appearance. Why green stuff reflects IR so much I have no idea, but it does at least make images that are more like what we should have had in winter. Muppet comes out jet black still, although Xena does seem to reflect some IR however. Last night was super windy; this morning there was a good covering of leaves from the trees. The shredded leaves were making interesting patterns on the surface of the pond as they formed into clumps and blew in circles in the remaining breeze. We see vibrant colours all around us all day, but there is lots we cannot see too. I fired up the infra red camera for a few test images today; they come out with a red sky, but swapping the red and blue channels make an image that looks more normal to us. Except the grass and leaves glow like crazy! It is amazing just how much foliage and grass reflects near IR light. The tree Peony is in bloom again too, providing a decent red that we can see. We stopped at the Yorkshire Sculpture Park for a few hours today. The sun was shining and the sheep crap was soft and sticky. We had great fun educating Alex as to what large-scale sculpture is all about. There were Moore's and Gormley's, Hepworths and others too. We also saw some bluebells. We had a really good walk today, including a visit to the dams that the Dam busters practised on. It has been years since I played pool; I am still crap at it.